• Only for non-Japanese travellers • This coupon applies to all items in the store. • The following products do not enjoy 8% discount: Apple products, video game consoles, video game software, imported watches, and outlet products (available at Nipponbashi Hall 1). • This offer cannot be used in conjunction with other offers. 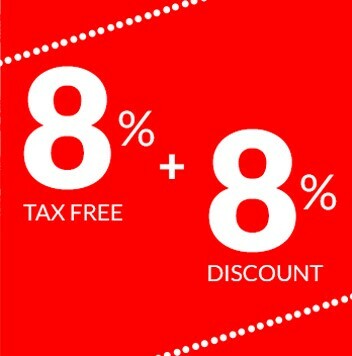 • Additional discount coupons that are already used cannot be refunded or re-issued when cancelling purchase. • This card cannot be exchanged for cash or sold. • The value of the ticket is in Japanese Yen • Any alteration(s) on the ticket will not be accepted by Changi Recommends and the appointed merchant.